Photograph of President Benjamin Harrison visiting Sutro Heights for lunch on April 27, 1891., Apr 27, 1891 - Photograph by A.J. McDonald. Courtesy of Dennis O'Rorke. Mr. President Samples the Vintage of 1853. Wanamaker Sticks to Water, but Rusk Looks on the Rosy - An Elegant Repast Served in Honor of the Party. 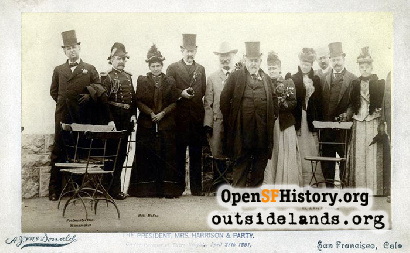 At the pleasant home of Adolph Sutro, overlooking the ocean, the President and his party were conducted to the esplanades, where they saw for the first time the Golden Gate, and for several minutes Mr. Harrison stood silently gazing upon the lovely scene spread out before him. He was interrupted, however, in his reverie by a photographer whose services had been secured by Mr. Sutro, and who turned his camera square upon the President. The latter was a little surprised, evidently, but he rose equal to the occasion and presented a bold front to the enemy. The hands, instinctively sought the inevitable overcoat pocket, and with the former thrust deep into latter and his hat well down upon his ears, the representative of 65,000,000 people stood for his photograph. One shot was enough to satisfy the cravings of his ambition and in spite of the remonstrances of the artist he turned resolutely upon his heels and walked away. This completed all were escorted to the house, Miss Sutro was in readiness to welcome them to the interior. The ladies were shown to apartments where they could remove their wraps, and the gentlemen were led to the north room to rid themselves of a portion, at least, of the dust that had been gathered on the long drive. But a short time was allowed to elapse before luncheon was announced and Mr. Sutro led the way to the dining room with Mrs. Harrison. Then came the President, who escorted Miss Sutro, and was followed by Colonel Sanger and Mrs. McKee. General Ruger remained to the last and slipped quietly to his place alone. Cognac, 1825. Chartreuse, Curacao, Kirsch. The President, as did all who were with him, did ample justice to the various dishes which had been prepared by Mrs. Morse, under the supervision of August Couper, and which reflected credit upon their skill. The wines were also sampled generously by all, with the exception of the Postmaster-General, who turned his glass down the moment he was seated at the table. "Mr. President, ladies and gentlemen: You have tasted our California sparkling wine and found it to overflow: you have also found the average California heart to do the same. For that reason, Mr. President, you become the victim of speeches inflicted upon you, but permit me to call your attention to the fact that this is a process of nature which cannot be changed. In the one instance, it is the carbonic acid gas, in the other the overwhelming quantity of ozone from the Pacific Ocean bottled up in the Californian's heart which finds its way out. "But Mr. President, I do not rise to inflict a speech upon you: I simply rise to present to you a photolithographic letter written by Sebastian Viscano, the great Spanish navigator. This is probably the first letter in existence written by any human being from California. It is dated at the port of Monterey, December 28, 1602, named in honor of the Conde de Monterey, then Viceroy of Mexico. It is addressed to the court of Spain and states that he (Viscano) had taken possession of this country for his Majesty. "We now know that the opinion he expressed about California at this early date was quite correct, for he says: 'The land is thickly peopled by Indians, is very fertile, and its climate and the quality of its soil resembles Castile, and any seed sown there will give fruit'. "The original of this letter I found in hunting through the Archivos de los Indias at Seville, Spain. At the date of this letter Queen Elizabeth was still on the throne of England, Louis Quatorze of France was not born yet, and the Pilgrim Fathers had not yet landed on Plymouth Rock. "Little did Sebastian Viscano dream that within three centuries this far distant land would be counted as one of the best, if not the best portion of the domain of a nation, the most enlightened, progressive and powerful on the face of the earth. "In connection with the history of California, it is a curious fact that the early navigators, Sir Francis Drake, Cabrillo and others, for two centuries sailed by the bay of San Francisco without discovering it. It was left to an overland expedition, undertaken in the year 1769 by the Franciscan Fathers from San Diego, to discover the bay of San Francisco, which they first supposed to be an inland lake, but the entrance to the bay from the ocean or the Golden Gate, was not discovered until four years later on December 4, 1774, by another expedition sent out from Monterey by Junipero Serra, the father of all the missions of California. "Mr.Theodore Hittell, the historian, speaks of this event as follows: 'They arrived on December 4th at Point Lobos where they supposed themselves the first Christian visitors. They erected a cross upon the summit of the hill, looking down upon the jagged point of the Seal Rocks on the one side, and on the deep precipices of the entrance into the bay on the other'. "Mr. President, we are glad they found the Golden Gate, for otherwise none of us would be here to-day. We are also glad that you will to-day behold it in all its natural grandeur, perfectly preserved as Junipero's soldiers saw it, for no modern cannon or extensive earthworks have been permitted to mar its pristine beauty. Mr. President, we all thank you for having come to see our beautiful land, and permit me especially to thank you for the honor of your visit to Sutro Heights." "I beg to thank you, Mr. Sutro, and to promise you personally and on behalf of those who journey with me, that this will be a red-letter day in our lives". When the party left the table they immediately donned their hats and wraps and were driven quickly to the train, and carried to a point opposite Fort Point, where the carriages were in waiting for them to convey them to the Presidio. Page launched 24 March 2002; updated 21 November 2011.